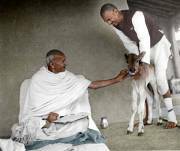 Mahatma Gandhi fondling a newborn - four hours old - calf at Satyagraha Ashram, Sevagram, 1937. Mahatma Gandhi and Dr. Sushila Nayar at Utmanzai, October 9, 1938. 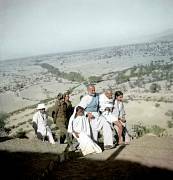 Dr. Sushila Nayar, Mahatma Gandhi and others walking in the countryside, October 1938. 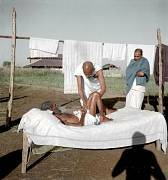 Mahatma Gandhi being massaged during his fast at Rashtriyashala Ashram, Rajkot, March 6, 1939. Mahatma Gandhi after performing an opening ceremony, Delhi, March 18, 1939. Mahatma Gandhi in the Palace garden of Rajkot Highness Dharmendrasinhji, Rajkot, May 25, 1939. 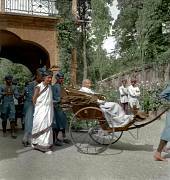 Mahatma Gandhi on his way to a meeting with the British Viceroy, September 26, 1939. 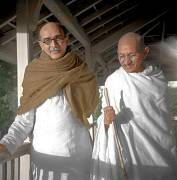 Mahadev Desai and Mahatma Gandhi at Bardoli, January 1939. Mahatma Gandhi speaking to Sarvodaya workers at Satyagraha Ashram, Sevagram, 1939. Mahatma Gandhi listening to address by Rabindranath Tagore, Santiniketan, February 18, 1940. 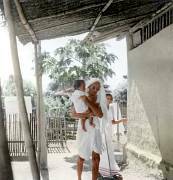 Mahatma Gandhi, carrying Anand, son of Shardabehn Shukawala at Satyagraha Ashram, Sevagram, May 1940. Mahatma Gandhi and others celebrating a wedding at Satyagraha Ashram, Sevagram, September 6, 1940. Mahatma Gandhi at the microscope observing leprosy germs at Satyagraha Ashram, Sevagram, c. 1940. Mahatma Gandhi calling Bombay from the office hut at Satyagraha Ashram, Sevagram, 1940. 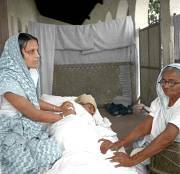 Mahatma Gandhi attending to a leper patient at Satyagraha Ashram, Sevagram, 1940.